You will see more videos over the next several days about the Knox County Commission workshop yesterday where a lot of information about Chapman Highway was shared and discussed. Victor Jernigan speaking to the Knox County Commission. 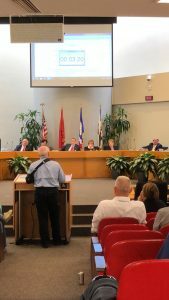 One of the citizens that spoke was Victor Jernigan, he made the most coherent, compelling and articulate argument for a James White Parkway Expansion. It is past time to complete the James White Parkway. How many people have to die because of Recode Rogero? How many people have to die?